About Us - Briskman & Binion, P.C. When seeking a law firm in Mobile, AL, individuals can put their trust in Briskman & Binion, P.C. for reliable and aggressive legal service. We have the highest Martindale-Hubbell rating among our peers. One hundred percent of our attorneys are AV-rated, which is uncommon among fellow law firms. We strive to provide a higher level of service to our clients. Established in 1988, Briskman & Binion, P.C. has extensive experience practicing in a variety of areas. Our founders, Donald Briskman and Mack Binion, have been selected for inclusion in Alabama Super Lawyers for multiple years running. Sarah Dorger and Josh Briskman have been selected as Alabama Rising Stars, also by Super Lawyers, for multiple years running. Only five percent of lawyers in the State of Alabama receive this distinction. Our attorneys have membership in all courts in Alabama as well as admissions to the federal courts in Alabama, including the Southern District of Alabama, the Eleventh Circuit Court of Appeals, and the U.S. Supreme Court. Visit us today to learn more about your legal options. We’re located directly across the street from the Mobile County Circuit & District Courts and the City of Mobile Municipal Court. This makes us the closest law firm to the State Courthouse in Mobile. 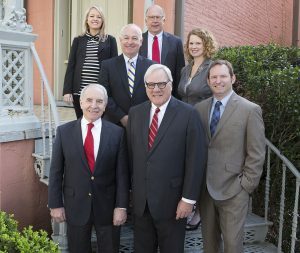 When it comes to law firms in Mobile, AL, count on Briskman & Binion, P.C. to be on your side. Contact our Mobile firm at 251-433-7600, or fill out this contact form and we will respond as quickly as possible.